When choosing an insurance broker to work with, you want to be assured that you have a reliable and trusted partner – so why not see what your peers say. What’s the point of customer reviews? As an insurance broker with a customer-centric team of specialists who work tirelessly to help dental and medical professionals find the right insurance at the best price, we know it’s not enough to just tell you why you should work with us – we need to show you too. With more research and spending now being done online, recommendations of where to make your purchase are now often from trusty online peers – and not from your friends over coffee. A study by Podium found that 93% of consumers take online reviews into account when making a purchase, so the trust in what your online colleagues are saying is high. Of course, independent reviews on well-known review sites are the most trusted source of information and two thirds of respondents to the same survey said they would not take into account comments on an unfamiliar review site. So, what do our customers say? It seems that you need no further persuasion to see the value in reviews, however from a business point of view, opening up the channels for customers to talk to each other is an important decision. The transparency shows our commitment to customers and strength of belief in our service. It also enables us to give you a true insight into our products. At All Med Pro we work with Feefo to gather and verify feedback from our customers. In the last year alone 100% of our customers have rated us 4 or 5 stars. 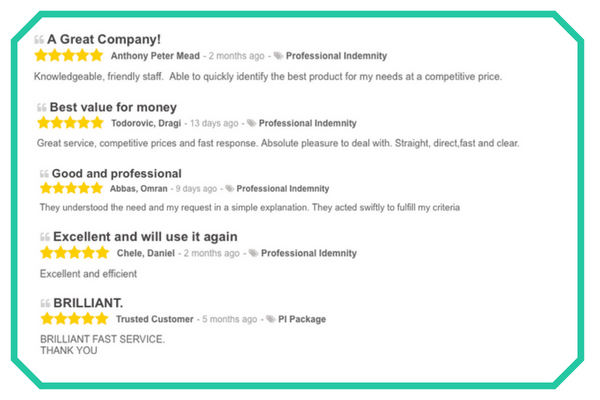 Here’s just a few examples of what our customers say. While we aim for 100% happy customers, even when a client may feel that not everything went right, we want to hear about it. Being able to improve our service or find opportunities to offer a better product is all part of our ethos. After all, when dealing with insurance, a customer only finds out the true value of their policy and broker when they have to claim. If you want to join the growing list of happy dental and medical professionals benefitting from our knowledge, customer service and insurance policies, contact us today to discuss your requirements.